I agree with ALL of this, Cait! Literally “not enough Batmanning” were my exact words 😁 at least Wonder Woman was awesome! *hi fives for our twinning opinion* It was really fun just not what I expected. AND OMG WONDER WOMAN = YES. Hey thanks for the detailed review. But I think I will give this a pass. Too big for kid stuff now. And I might keep thinking about the movies. I was expecting more action and less Bruce story in this one. I enjoyed Wonder Woman. But towards the end I found it too unrealistic and kiddish (when the ghosts come and haunt?). Argh. Ok now I am conflicted because I love origin stories and I have read rave reviews this one, but I love Batman with his bat wings and usually I 90% agree with you and ARGH. Yes. You are most helpful in aiding and abetting my TBR in murdering me. I’M HERE TO BE A PAIN….um *coughs* I mean…wonderful and helpful. Haven’t read Wonder Woman yet and ato be honest, I’m not that much of a DC fan (don’t kill me pls hahahaha). Anyway, after reading your review and the fact that I’m not that into DC, this book is basically at the bottom of my TBR pile. And a book about Batman without much batmanning is a no-brainer for me. Oh, I LOVE BATMAN! When Batman vs Superman came out I was totally freaking out screaming all over the house and my mom looked at me so weird, but oh wow, I fangirl over everything. LOL, I almost fell asleep with the Wonder Woman movie, I don’t know if it’s just me, someone help me. 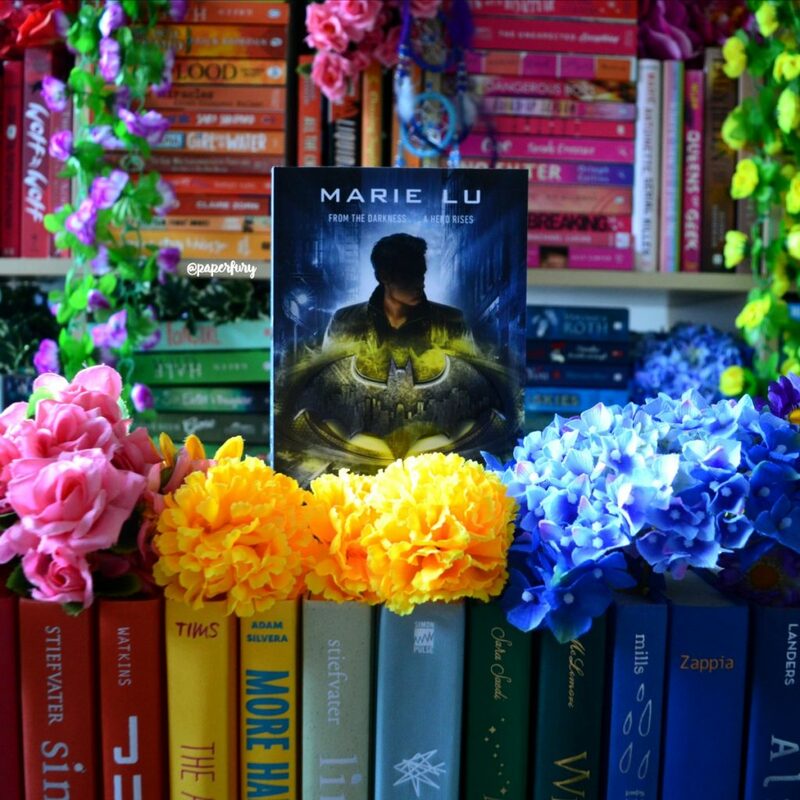 And I soon want to start with Marie Lu’s books, I only see good reviews of her books, but haven’t read anything about this one. Sadly, I’m a Gryffindor, all the quizzes in the world say I’m a Gryffindor while I say I’m a Ravenclaw and even my friends say I should be a Ravenclaw (!). Well, if Bruce is just so much lovely in this one instead of wanting to murder, I won’t have high expectations, at all. But I want to read and see what my mind will think about it. But about that, THAT’S SO COOL, I ALSO EAT EGGS IN BREAKFAST, EVERY MORNING. WE WERE MEANT TO BE SUPERHEROS. At least we turn to be villains…, that could be very funny. And Alfred’s the best father I could ever have. The plot actually sounds unrealistic so, again, no expectations, just curiosity. Also, I would love it to have batwings… To answer your question, I want the childhood story of Wolverine. If you write it, better, I don’t want to be disappointmnent. I haven’t even read Wonder Woman and I feel so lonely, but I will when I can. Have a great day! And give some hugs to your dog, he’s so cute ! I fell asleep in the Superman movie and haven’t seen a DC movie since haha.😂I’M SORRY!! I want to see Wonder Woman though so fingers crossed?! I’ve seen two of the DC films: Wonder Woman and Justice League. Both were glorious. This book is already in the mail, on it’s lovely way my direction, and I’m kind of feeling mixed. I mainly got it because it’s in a series, and I’m a sucker for wanting the COMPLETE set. But I’ve heard all these mixed reviews, so that’s dissapointing. The cover is gorgeous so at least there’s that.😂But haha don’t get me wrong! It wasn’t a bad book, it just wasn’t really everything I wanted! Okay, I’ve been looking forward to this even though I’m not the biggest Batman fan (I like my comics with some humor, thank you), but they seriously sent a TEENAGER into a PRISON? Like, dude, no. That is not going to go down well. And why is a teenage girl in prison, anyways? She would be in a juvenile detention center unless the Gotham legal system is even more messed up than I thought. IT DOESN’T EVEN MAKE SENSE. And like the girl he falls for is literally in an asylum…she shouldn’t be there?! She wasn’t “insane” in any sense of the word at all?! It made the plot so contrived. I ended up with a copy of this from BFest last year and ended up not liking it at all. But I also didnt end up liking Wonder Woman either I felt like it didnt have enough depth. I really wonder if these authors were given free reign to do what they wanted or if they were given guidelines on what they could do. Becuase so far these are more surface stories than anything that we know these authors can do. I’m a bit scared of this book because I really didn’t like Warcross and when I read your review and you say it has a lot of tech in it I get cold feet! I’m going to give it a try and hope it’s better than Warcross and that the tech part isn’t as wrong as it was in Warcross! Ahh, I still haven’t read Wonder Woman Warbringer eve though I WANT TO SO BAD, but my TBR is plotting my death so I’ll get to it at the ends of times. I relate to the TBR problems don’t worry.😂 Also Wonder Woman is SO AMAZING. I, too, was assuming that this would be dark and brooding with a splash of blood. I will now go into this book expecting something NOT that. I THINK YOU JUST SAVED MY READING EXPERIENCE. YOU’RE WELCOME. I’M HERE TO SERVE. Well I’m here to eat cookies and throw books around but same difference. Tbh I hate all of the batman movies. The only one I can really stand is Bruce Wayne from the show Gotham. All this talk of Batman makes me think of something my mom told me once. She used to work at a craft store and on Halloween children would come and trick or treat around the store, and there was a little boy dressed as Batman. My mom asked him if he was Batman, and he leaned in and whispered, “No, I’m Bruce Wayne.” And giggled like it was a secret that no one knew. HAHAHAHAH! Kids are funny:’) I love that show! But like why does the Batman in the movies, always have to say, “I’m Batman!” In his deep weird unrealistic voice. I don’t understand! Batman just kind of seems dumb to me, he is like Iron-man but with less flare, they are both literally just rich dudes. 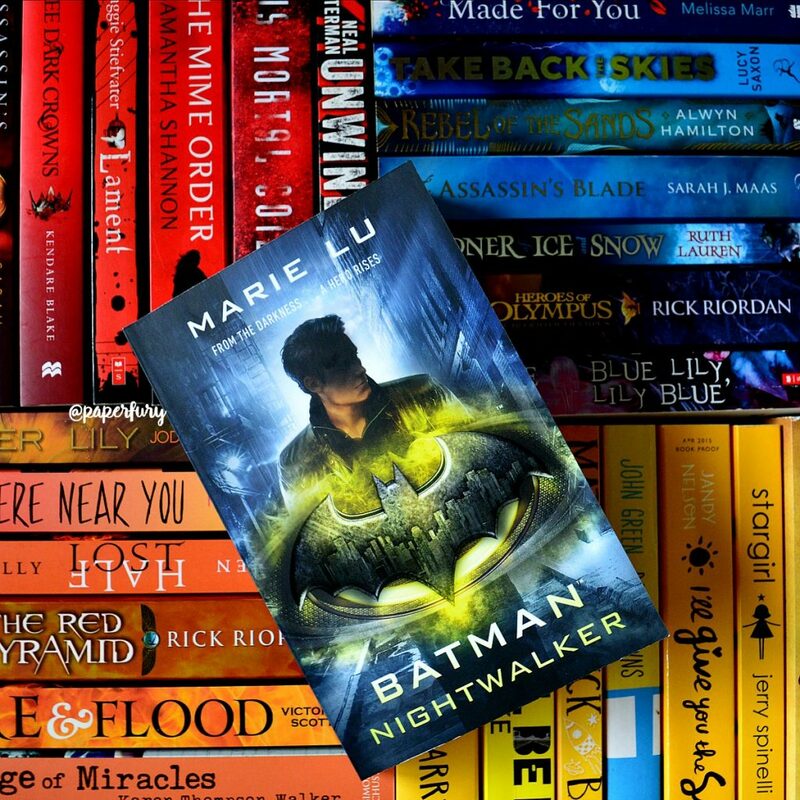 But I’m excited to read Batman: Nightwalker, because I have never been disappointed by a Marie Lu book. I didn’t read the Wonderwoman: Warbringer. 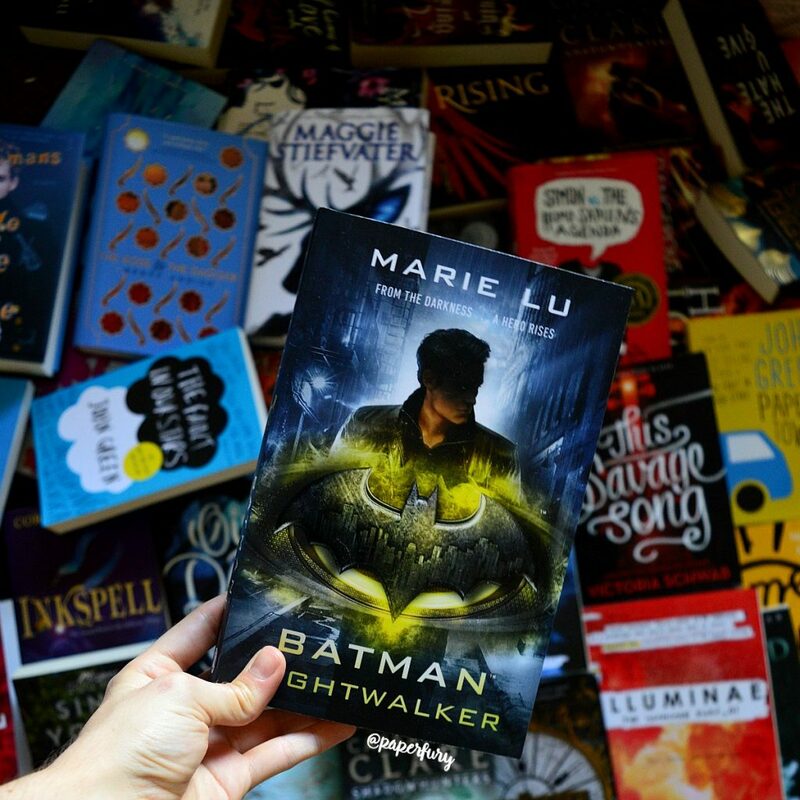 I debated it, but I saw it at the bookstore and it had tiny writing and I said, “That’s intimidating let me get this other book instead XD” But yeah…I’ll definitely read the Batman: Nightwalker though! Noooo I LOVE BATMAN. I actually love Ironman too they’re like my two favourite superheroes.😂😂And spiderman. And Black Widow. Okay omg I have a lot of favourites but Batman definitely is one of the top haha (although yes there are some dreadful cliches but what superhero movie doesn’t have them?!) 😂 But hey if you like Marie Lu this will probably work great for you!! DARN! I personally was wanting the book to be more about Batman and less Bruce Wayne. But when I saw the summary of the book get released, I knew things would be different. I’m hoping to go into this one not thinking of this as a sequel to Christopher Nolan’s Dark Knight Trilogy, and think of it more as something entirely different. Either way, I still and SUPER excited about this book. I’m planning to read Wonder Woman first, and then read this, but I’m hoping to get to it soon. Good review! I adore the aesthetics. I honestly didn’t look closely enough at the summary because it DOES say Bruce Wayne…but how can the title be Batman when he wasn’t?! But yeah definitely don’t go in comparing it to the Dark Knight.😂😂 I hope you like it!! This sounds a teensy bit like the early seasons in the tv show Gotham… except there is more fighting there. Seems interesting even if there isn’t much Batman. To a certain extent, I feel like batman has been *so overdone* that maybe it is best that it isn’t all about his crime fighting abilities. Thanks for sharing, Cait! I’m definitely more of a Marvel person too I admit.😂 I wish Marvel would come out with a set of books like this?! BLACK WIDOW IS THE BEST AND AMAZING AND AHHH. The problem is… I kinda, almost WORSHIP your opinions. And like I want to read this, but I am scared because I want to BE the Dark Knight / Batman / Batsy. So I’ve wanted to pick up this book now but also I am scared because if it’s not ENOUGH Batsyness happening I’ll probably be very disappointed. So bottom line here is…Should I do it? Cus that cover is glorious and I may do it anyways just because it looks so darn pretty. Basically from 1-10 how much would you recommend it for someone who has legitimately dreamed of being the Bat in the night? Omg, Gissel.😂 NOW I FEEL THE PRESSURE. hahah. (But I’m also very honoured and will give you a ton of cake.) I fell like you could just try it and see? Because it was fun and cute at times and if you don’t go in expecting like, the Dark Knight or anything, maybe it’ll be fun? Also it’s like 250pgs so it’s not a huge commitment. hahaha no, didn’t mean to give you pressure. Yay cake! Thanks! I just legit have become mildly obsessed with your thoughts on books because I tend to agree on it all…so you’re like the one reliable source in the blog world I can count on like 90% the time. Yes, even though I’m a pretty new follower and totally didn’t like stalk your blog since I found it…no I didn’t (but I totally did). I think I’ll dive into it and lower my Batman-ish expectations and raise my Bruce ones…It should level out 😀 Thanks, Cait! I love the Dark Knight with Heath Ledger. I’ve heard that Jack Nickolson’s portrayal of the Joker is great as well, but I have yet to see that adaptation. The only DC Icons book I would pick would be Wonder Woman and that’s because I love Leigh Bardugo, but I’m not sure if I would pick up any others. None of them really appeal to me. yesss the Dark Knight trilogy is basically my favourite batman ever!! Which is probably why a tamer version sort of underwhelmed me.😂 But Wonder Woman is fantastic! I'm going to go into this book with a lot less expectations now. Perhaps prepare for some fluffy YA instead of something intense, like the cover suggests? Also I'mmm not sure if I'll be onboard with that romance just because the whole situation seems wildin. Anyway, I do have plans to see Lu on her tour for this book so hopefully I find it as fun as you did! Yes exactly! I think it’s just not the dark-fest that I always think of in association to Batman (probably because of the Nolan films😂). And aww thank you about my photos! I had fun with this shoot! I can’t wait to get to this series <3 I bought WonderWoman when it came out and somehow managed to get the rare special edition (only because Amazon effed up my order and I had to go outside to buy it in store), so the others will have to be special editions, too, if they want to sit next to each other on my shelf. I’m definitely looking forward to this – good to know what’s coming! Great post! 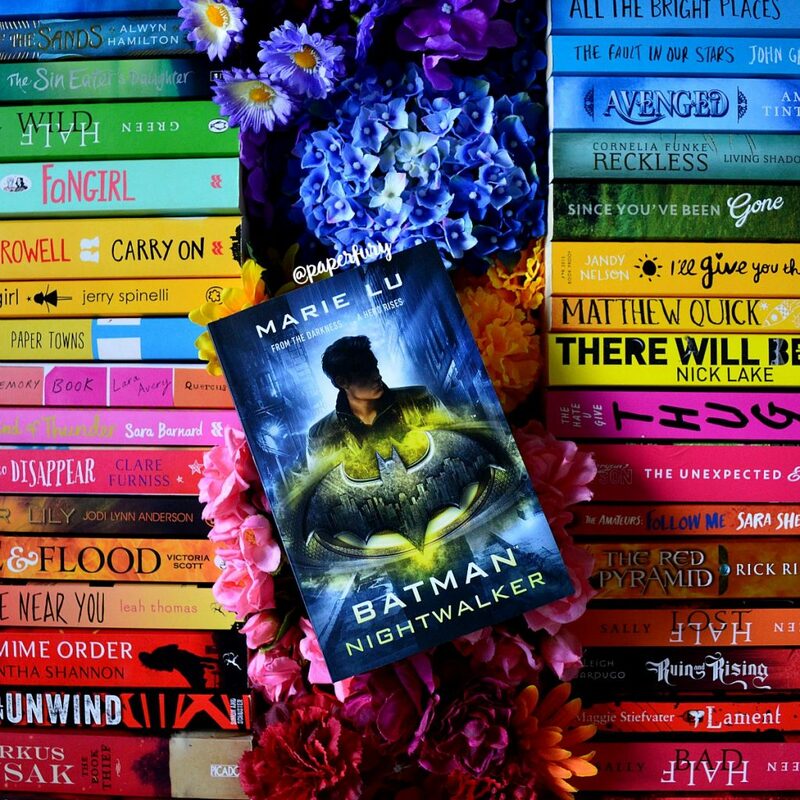 I still haven’t gotten to Marie Lu’s books, but she’s a big one on my 2018 tbr. And I’ve been seeing this one around a lot of late. Great critique on the pros and cons here! Ooh I hope you enjoy her books when you read them! Yessss, I’m kind of glad I read a few reviews beforehand to say that it was more about Bruce Wayne rather than Batman. 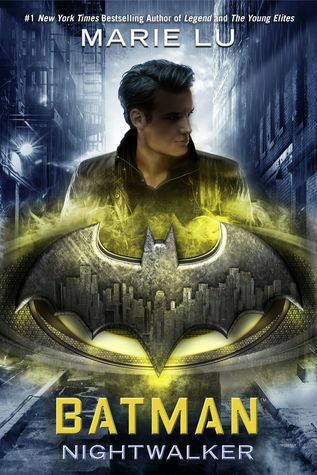 I still adored this book though because I’m a big Batman fan, and Madeleine was so conniving!